I recently came across an online collection of USGS photographs that had been taken in 1909 in southern Pima County and Santa Cruz County of Arizona. Those photos were later incorporated into a bulletin: "The Mineral Deposits of the Santa Rita and Patagonia Mountains" that was published in 1915. Of the photographs, I thought that the most interesting were those of several mining operations that had been visited during the 1909 field work. It did not take a lot of thought to decide to travel out to the old mines in the photos and see what was there. I had not really been down into those old mining areas in quite a while, so this project would be a chance to become re-acquainted. 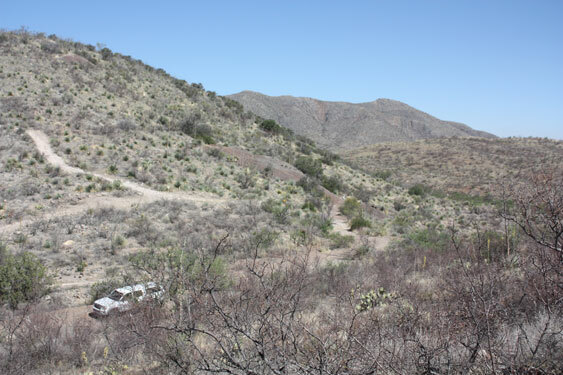 Also, most of the old mines down there(from Tucson) used to be on interesting 4WD trails and I wondered what those were like these days. The following photos show how things today compare to what was there in 1909. As can be seen, there has been tremendous change in the 103 years since the early photos were taken. Basically, it is much quieter today as far as mining activity is concerned than it was in 1909 when both mountain ranges were literally rocking! 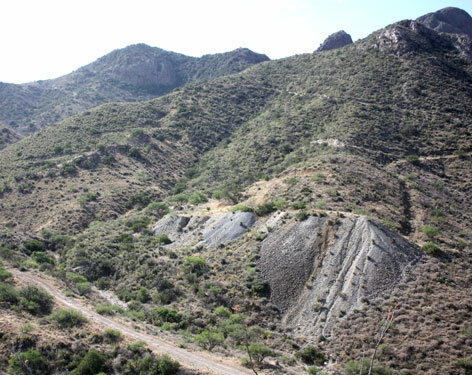 The Salero Mine pictured in the photo above is located at the southern end of the Santa Rita Mountains about 7 miles northwest of Patagonia on the Salero Ranch. Unfortunately, access to it is not granted to the general public today, and so I was not able to take a modern photo of this old mine. The Ranch does not permit any travel off of Forest Service Road 143 that passes through their property. Buildings from the old mine camp can be seen in the distance from the road, so it may be the one example of a location that still has building structures from the early 1900's still standing. I was not able to spot the mine site. 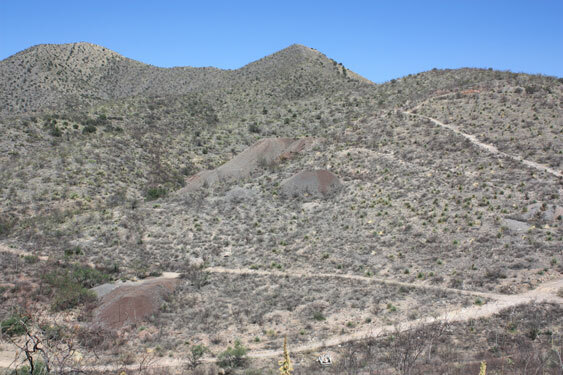 This was one of the oldest mines in the area, discovered in the 17th century and was worked in the early 1800's by Jesuit missionaries from Tumacacori. Later, American owners sank several shafts and shipped lead and silver ores. At the time the photo was taken, the mine was described as "well-equiped and was working 20 men". I believe that the stacks of material seen in the photo were cords of wood that would have been used to fuel the steam equipment on the property. The Alto Mine is located about 2 miles northwest of the Salero Mine. It is also on the Salero Ranch and is fenced and posted against trespassing. But the location of the old camp and the mine can be clearly seen from the road. From that distance, there do not appear to be any parts of the old camp that remain. A plastic lined basin of unknown function now occupies a portion of the old camp area. The Alto Mine was also discovered by Jesuit Missionaries and worked by them until the 1850's. Later owners further developed the mine by sinking several shafts and drilling many feet of tunnels. Recorded production was more than 3500 tons of lead and silver ore. In 1909, the mine had been recently re-furbished and was employing 5 to 10 men. Just north of the Alto Mine, the road leaves the Salero Ranch and enters the National Forest. A short distance away, is an adobe ruin associated with the Alto operation. There are many other old mines in the vicinity with their dumps and old foundations. Forest road 143 across the Salero Ranch is a good 2wd dirt road. From the Forest Boundary westward, 4wd will be appreciated. 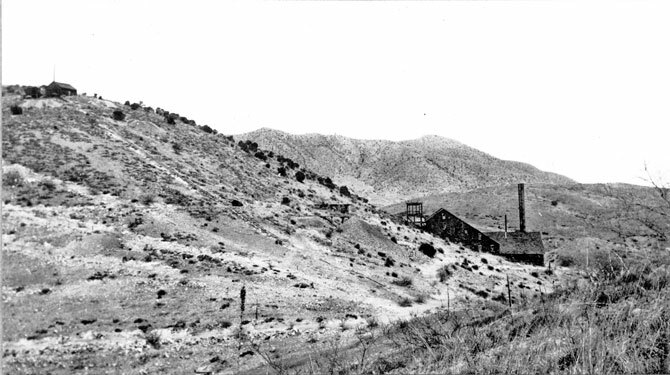 The World's Fair Mine is located a few miles south of Patagonia on the Flux Canyon Road. 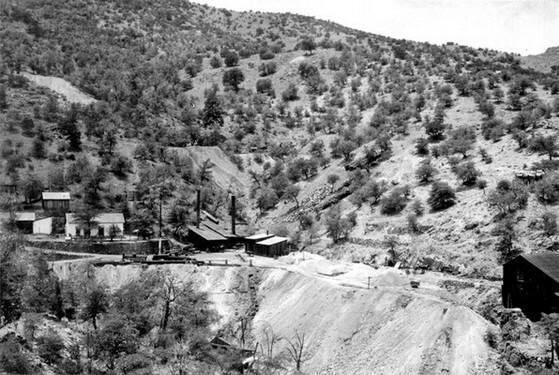 It was worked intermittently from the 1880's through 1954, producing some 13,000 tons of Silver, Lead and Copper ores. It was estimated that at one time there were 15000' of shafts and tunnels that made up the mine. In 1897, a 10 stamp mill and concentrators were installed, but apparently did not work well in a 3 months trial run. They were not used afterward. The camshaft from the stamp mill and the remains of a concentrating table can still be seen. The mine was closed down when the photo was taken in 1909. 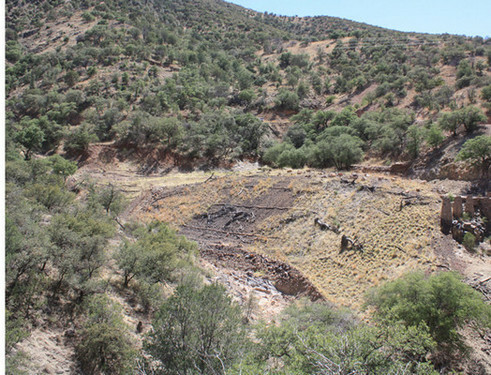 Reclamation work and re-vegetation have recently been done at the site. I wondered whether the old stone retaining walls at the left of the 1909 photo were removed in the reclamation process. A "fish-net" mesh retention material has taken their place. One of the stone walls near the center of the photo does remain however. Having a 4WD vehicle will be appreciated on the Flux Canyon Road. There were pools of water in the canyon when I was there in mid-June. The Sweet Mine is located in Mansfeld Gulch north of Patagonia. It was associated with the nearby Black Cap Mine as part of the Mansfeld Group. 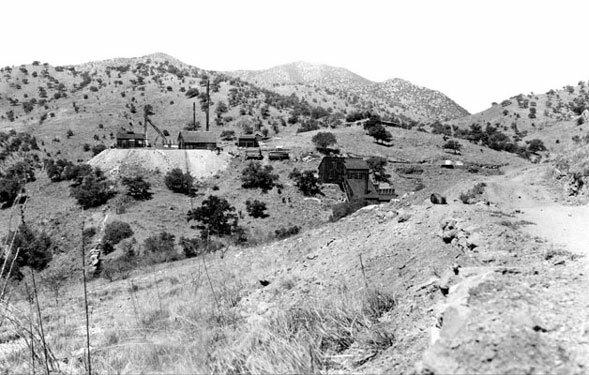 The mine was worked intermittently from 1879 through 1951. 370 tons of lead, silver and some copper ore were shipped over the years. The primary workings at the mine consisted of a 360' shaft with a couple of levels. Flooding at the bottom of the shaft was a problem back in the early 1900's. 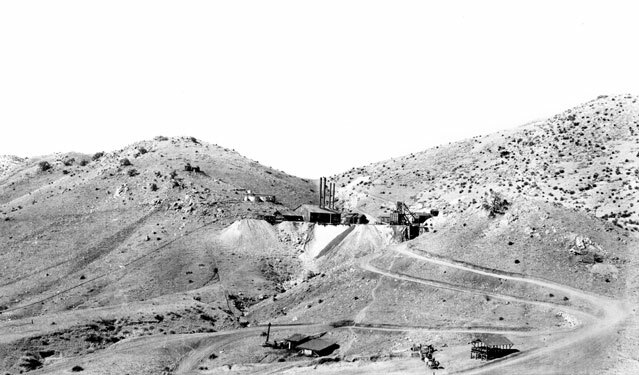 There was a 30 ton matte smelter put in at the Sweet Mine that reduced the ores from both the Black Cap and the Sweet operations. Today, pretty much all that remains are the dumps, the shaft with its concrete collar, and a few other concrete foundations. I could not locate the slag pile from the smelter. A group of thick trees blocked the view and prevented me from setting up at the position taken by the original photographer. The road to the Sweet Mine is easy 4wd up and out of Temporal Gulch. On past the mine, the driving becomes more severe as the road climbs to many other old workings. The Total Wreck Mine is located on the northern end of the Empire Mountains. 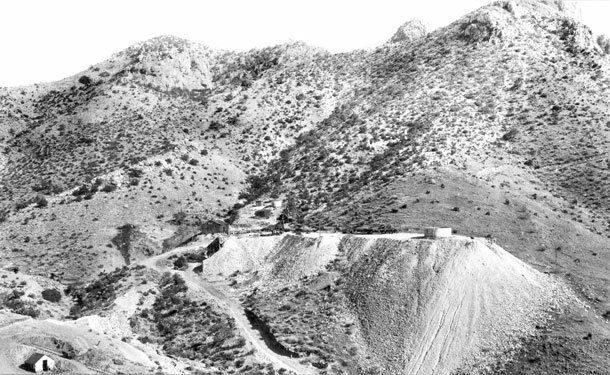 The authors of the USGS report considered the Empire Mountains, which are east of the Santa Ritas to be outliers of that range so this mine was included in the report.The mine was discovered in 1879 but soon changed hands. Around 1880-81, a large concentrating facility was constructed featuring a mill with twenty 950 pound stamps. A pipeline was constructed to bring water to the mill from several miles away. It was during those earliest years prior to 1902 that the majority of the mine's total production occurred. After several years of low production another spike occurred around 1907. The mine was at idle when the 1909 photos were taken. The last production ended around 1940. The ore was primarily lead, and silver with some copper. Several shafts were sunk over the years and drifts, tunnels, winzes, and stopes branched from those. The major opening was an inclined shaft that extended down to a depth of 460'. There are no standing structures at the mine site today. A large rock wall that served to anchor the mill building against the hillside is the most impressive feature still standing. There are scattered concrete foundations, small rock retaining walls, scraps of lumber, and pieces of sheet metal scattered across the site. Access to the site is by 4WD. I like to come in from the north on a dirt road that exits I-10 just west of Cienega Creek. After visiting the mine site, I usually continue on the gas line road south to East Empire Ranch Road on the Las Cienegas Preserve. 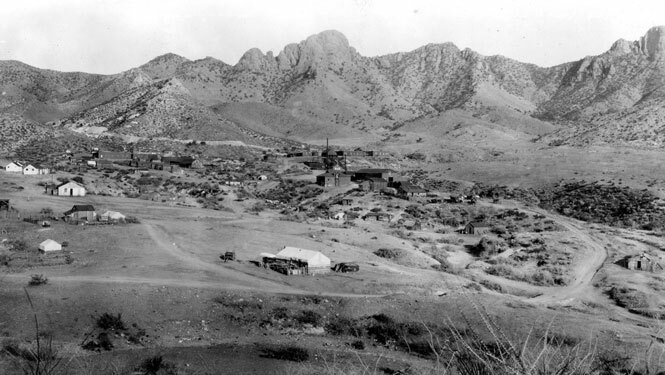 Helvetia was a mining camp located on the northwestern slopes of the Santa Rita Mountains about 25 miles southeast of Tucson. It was first settled in the 1880's with an official post office set up in 1899. The camp was a place for the workers in the many mines surrounding the camp to live. At its peak, the camp reportedly had about 300 inhabitants. A 150 ton smelter was established and reduced the ores from not only the local area but also from distant mines. I believe that it can be seen in the center of the 1909 photo. Fuel oil was burned to power the smelter equipment. 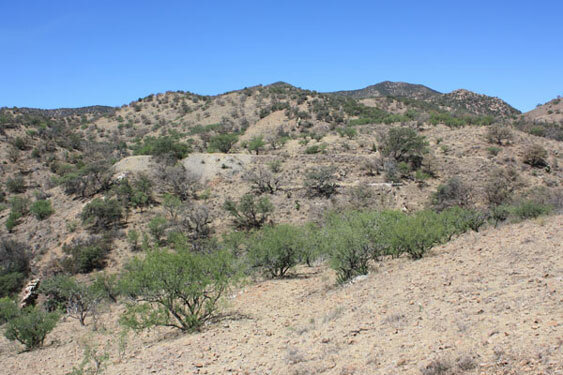 The ores from the local mines were different in that they were primarily copper, while the other mines in the Santa Ritas and Patagonia Mountains produced more lead, zinc and silver. The Post office was abandoned in the early 1920's. A working marble mine lies just to the north of the old camp and just over the skyline to the east a new copper mine is being promoted in the Rosemont area. All of the other old mines sit quietly. 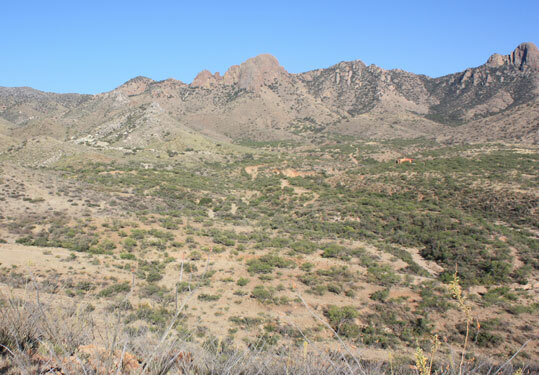 A popular 4WD trail that crosses over the main ridge of the Santa Rita Mountains through Gunsight Pass essentially starts in the old Helvetia town site. Just northeast and "up the hill" from the old Helvetia townsite and alongside the Gunsight Pass 4WD trail sits the remains of the Isle Royal Mine. Although discovered in the 1880's it was not really developed until just after the turn of the century. A double compartment 800' shaft was sunk. That made the Isle Royal the deepest mine in the area. 4000' of underground workings on seven levels was completed. 30,000 tons of copper ore was shipped down to Helvetia. 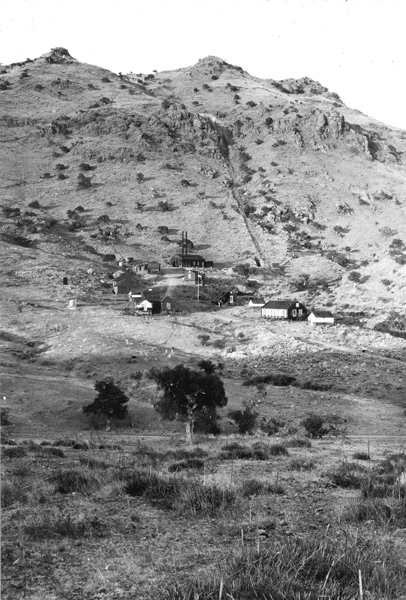 By 1908, the mine was considered to have been essentially worked out. 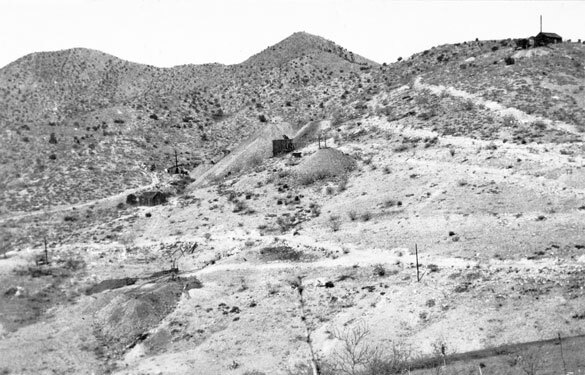 Not much remains at the old mine site today except for a few concrete foundations, pieces of lumber, firebrick and a pile of coke and coal at the far left side of the dump where the buildings are seen in the 1909 photo. 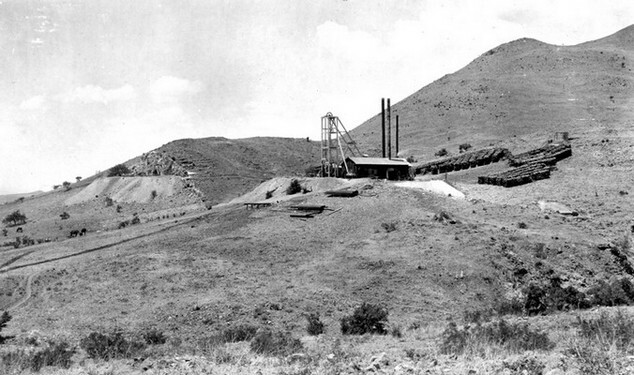 At the time of the USGS Field Work in 1909, the Copper World Mine was the primary producer in the Helvetia area. It was located directly across the road from the Isle Royal Mine about 1 1/4 miles NE of Helvetia. Discovered around 1900, this copper mine was accessed through a 500' double compartment vertical shaft. There was calculated to be about 12000' of underground workings in drifts, tunnels, winzes and stopes. The mine closed in 1910. 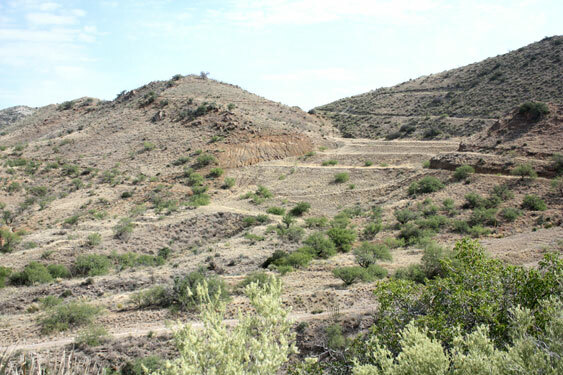 The Copper World Mine area has recently been reclaimed. There is almost nothing of the old mine remaining! An alcove in the hillside and a concrete pad where the hoisting machinery was located can be seen. There is a remnant of one of the metal tanks on the left hillside still in place and a few firebricks are scattered around. That is about all that I could find. 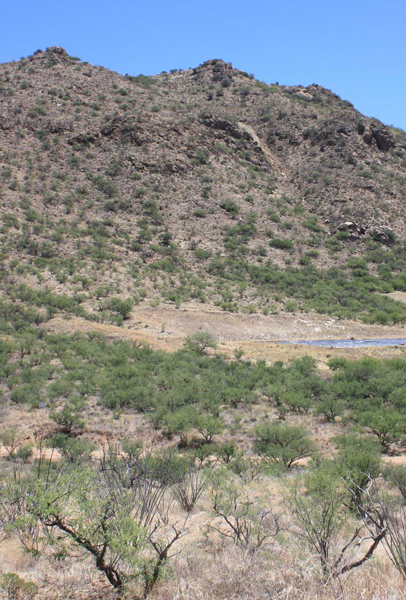 The reclamation work may have been done by the folks at the proposed Rosemont development to show that they can be good stewards of the land.